Google released an update for its Play Store today that’s chock full of improvements including a slightly revamped UI and a new settings menu that should keep you (or your kids) from accidentally spending a fortune on in-app purchases. The app store upgrade isn’t being pushed out just yet, but Android Police has a link to the APK if you just can’t wait. The biggest update may be Google Play’s new trick for blocking rampant in-app purchases. Head to the settings menu and you’ll see a new Password option. 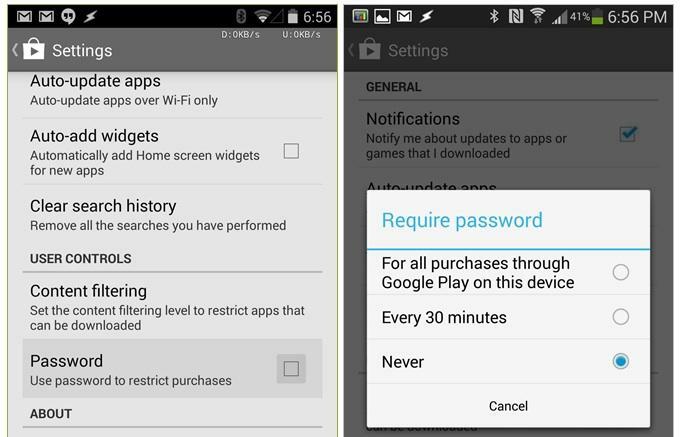 Click it and you can choose whether the Play Store will require you to re-enter your password for every new purchase, every thirty minutes or never. New apps will also include a warning that they feature in-app purchases when first installed. This is similar to an update in iOS 7.1, which requires a password every 15 minutes before allowing you to purchase new in-app content. Other improvements include a fix that makes it easier to quickly add widgets and the option to set Google Play to self-update automatically in the future. The UI has also been tweaked so the Settings and Help menus are located in the slideout drawer while a few other design changes are scattered through the app store. Like we said, Google isn’t pushing out this update just yet so don’t worry if you don’t see these features on your device. If you absolutely need to be the first of your friends to have the latest version of everything you can hit the source link below. If not just sit back and try not to make too many in-app purchases before the official rollout begins.